Work to "improve reliability" on one of the busiest railway routes in the South East is going "well" amid a nine-day closure, according to rail bosses. 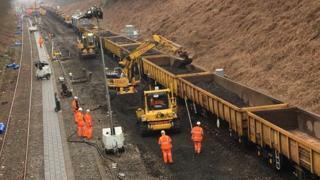 Thousands of commuters are facing major disruption until Sunday during a £67m upgrade of the Brighton Main Line. There are no direct trains between Three Bridges and Brighton or between Three Bridges and Lewes with services to and from London diverted. The closure is timed with half-term as fewer passengers are expected. A Govia Thameslink Railway (GTR) spokesman said: "Network Rail's reliability improvement work is progressing well, and our alternative transport arrangements have been going to plan with praise for our teams on the ground from many passengers. "We have contingency buses to relieve pressure on trains and to keep passengers moving if crowds build up somewhere on the network." The upgrade is the biggest refurbishment of the line - which is used by more than 300,000 passengers per day and renowned for being one of the most unreliable parts of the network - in more than 30 years. It connects the south coast with London on Southern and Thameslink trains. GTR said the alternative to the closure would have been two years of "drawn-out disruption". The closure means there are no trains stopping at eight stations including Haywards Heath, Burgess Hill and Hassocks. Services to and from Brighton are being diverted along the coast via Littlehampton. A replacement bus and coach service is also in operation. Over the weekend, there were reports of a replacement bus service driver getting lost on the M25 while travelling between Brighton and Three Bridges. Passenger Daniel Gurr tweeted on Sunday that it was a "replacement bus nightmare". GTR said: "We have over 530 drivers working with over 240 buses in circulation and apologise if one of them took a wrong turn. "This happened yesterday when the route was blocked by a traffic accident." The upgrade includes renewing track junctions and signalling, shoring up embankments, along with extensive work in four Victorian tunnels to stop leaks and drainage issues.